Rachel grew up in San Jose, CA where much of her time was spent outdoors soaking up the California sun. Although CA has always been home, Rachel has spent many a summer enjoying the majestic and serene nature of the Green Mountain State of Vermont, while visiting with family. Whether she was hiking in Yosemite, swimming the fresh water of Vermont, or camping and water skiing on the lakes of Northern California, she’s always had a deep appreciation for the beauty and adventure mother earth has to offer. This love of nature and open space is what initially attracted Rachel to the Land Conservancy of SLO County. Rachel joined The Land Conservancy with 10 years of combined experience in finance, office management, and client relations. Prior to joining the team, Rachel served as the Lead Analyst for the merchant risk management team at MINDBODY, Inc. 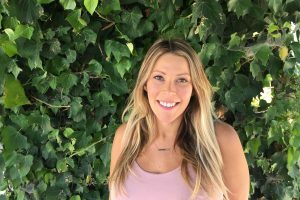 Earlier in her career she served as Office Manager for both a construction business and a fitness center, as well as specializing in client relations for a property management SAAS company in the Bay Area. In 2012, Rachel and her family packed up and moved to the Central Coast to be closer to her husband’s businesses and to raise their daughter in a small family friendly community. They have been thoroughly enjoying all that the central coast has to offer ever since! Outside of work, Rachel enjoys bike riding, camping, beach days, refurbishing old furniture, and most of all, spending quality time and laughing with her husband and daughter.